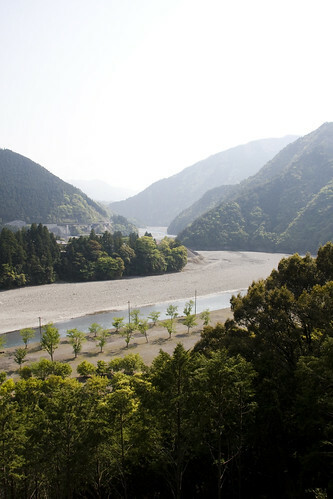 Japanese Landscape and Locations: Where I Proposed. Or. 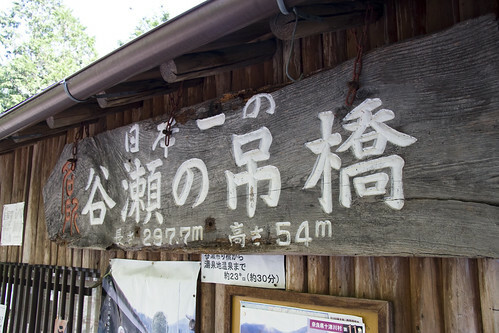 Tanise no Tsuribashi. Where I Proposed. Or. Tanise no Tsuribashi. Asking someone to marry you is something that growing up you imagine you'll eventually do hopefully once in your lifetime, but how to do it is something you never think about. The process of getting from dating to marriage was lost to me. Of course there’s the cliché version of what will happen that is ingrained in your mind from countless fairy tails and Disney movies. It seems to involve expensive rocks, flowers, and getting down on one knee. Then there’s the teaser story for the 11 o’clock news method. That typically involves putting it up on the jumbotron at the local baseball stadium, or skywriting. When I actually decided to do it the how part of the situation is missing. I decided that I was going to ask my future wife, Y, to marry me sometime in late 2007. That’s all I knew. A little background. I'm a California born American, she's a Kansai born Japanese. Our relationship is about 70% Japanese 25% English 5% laughing and other nonverbal communication. We can understand each other very well, maybe even more so than same language couples thanks to our language differences. I’ve known Y since the Fall of 2005 and we’ve been dating since the Fall of 2006. When I was an exchange student I use to study my Japanese at her coffee shop. Besides providing a great place to do my homework, she would make a different lunch each day and I loved each one. Her older sister, who also worked at the coffee shop, would gasp in astonishment that I could use chopsticks every time I used them. Back then my Japanese ability was meager at best. I couldn’t have grown as much as I have with out Y’s help. When I came back to Japan after a month in the US between graduating and starting my current employment. I returned to the coffee shop the day before it was to close. At first Y and I would just go out for fun. After a few months of hanging out together we grew closer. I never would have expected at that time that it would lead to this. Although, the first time I met Y way back in 2005 I knew she was special and that I liked being around her. I have learned just by being with her that Y wouldn't like a ring. She’s not that kind of person. That was good for me in some ways; I've got no clue how to buy a ring, how much to spend, what stone to get. However, the lack of a ring also presented a new problem: how to ask and make it meaningful. I chose to wait till we were in a beautiful place. Something memorable. When Y suggested that we walk across the longest suspension bridge in Japan on a 2 night car trip we took the other week I knew I had a chance. I knew where, but I didn’t know what to say. The language difference did play a role. Which language should I ask in became important. I chose to ask in English. It seemed to me that asking in Japanese wouldn't reflect me, my history, who I was. Although I love being in Japan, I’m not Japanese. My favorite Japanese way to propose is to ask, “Will you wash my underwear?” I love to ask that to Y jokingly. Her reply is always a stern, “NO!” I chose to ask the only way I knew how with the simple “Will you” line. 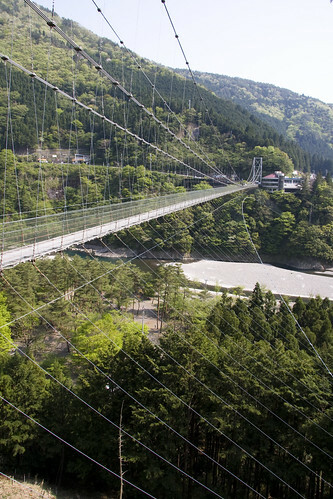 Tanise no Tsuribashi is a 297.7 meter long bridge stretched between two mountains 54 meters above a wide rocky riverbed. Needless to say the view there is amazing. It's also amazingly scary. I like bridges, buildings and engineering wonders like that, but I don't like heights. My fear was even more elevated by the swaying of the bridge, and the beating of my heart. Below the bridge is a campground where the main activity seems to be making pictures out of white rocks for people on the bridge above to read. A majority of the stone pictures were names, dates and silly pictures. Another one had the name and phone number of a popular sushi restaurant in Itami city, Osaka prefecture. The one below says, “Drive safely.” Something written all over Japan, but not read so often. By the middle of the bridge I had gotten use to the shaking and I could enjoy myself enough to take a few photos. We got to the other side, took a few more photos, looked around and decided to walk back across. 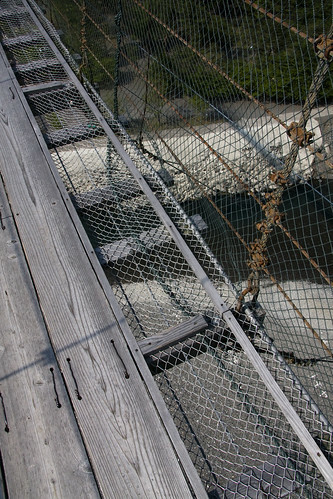 The odd thing about this bridge is that the locals use it, but for the tourists there’s really nothing to see on the other side. The bridge itself is the attraction. A free attraction I might add! We both donated 100 yen to it’s upkeep, however. I wonder what percentage of crossers are locals vs. tourists. It was halfway across the bridge, after stalling her a few times so I could build up the courage that I asked the question. I affirmed that that was what I said. Y replied in a burst of screams and smiles and just joy. In a mild delirium I made are way back to the car with Y, skipping the customary omiyage shops. 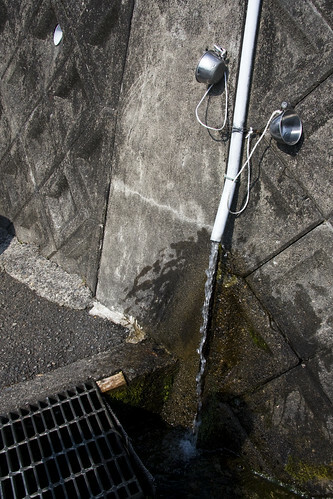 In the parking lot there was a pipe funneling natural water down off the mountain with two metal cups on strings. I drank my fill and splashed water on my face and through my hair. We got into the car and continued our trip. In the car I asked timidly, "So that is yes, right?" She replied, "Of course yes! Why did you ask again?" "Well, you never actually said yes. I kinda wanted to hear that word." "I didn't say yes? I thought I did. What did I say?" We laughed and continued down the road. I chose the bridge for a few reasons. I thought there was a lot of symbolism in the bridge. We had made it across together and we made it back together. 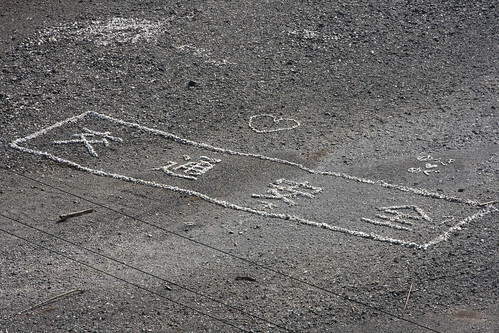 Marriage marks the middle of ones life, and I asked in the middle of the bridge. I don't know what will happen in the future, but if we go into the future happy together like we were on that bridge I'm sure can overcome whatever problems we encounter in the future. The photos are from my Tanise no Tsuribashi set at Flickr. I am all teared up... having met Yuko and seeing you both together I know what you said is true. You and Yuko do make a great pair and I am so happy for you both. 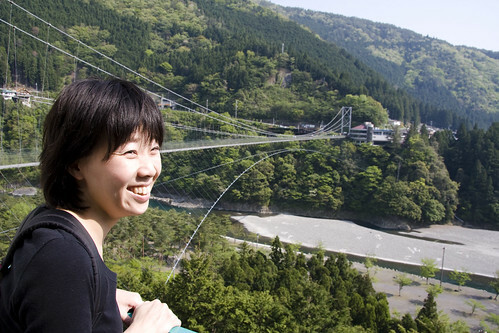 Love the story, love the picture of Yuko on the middle of the bridge, to me that sums up Yuko charming, fun, cute and most of all smiling, love the fact you shared that with us. Dang man. I have creepers I couldn't hold back. At least I had tissue close. I'm so happy for you Lammy. She's absolutely beautiful, as are you. Can I bring my elephant? Futari de suenagaku yoki jinsei wo sugoshite kudasai!! Love is the master key that opens the gates of happiness by Oliver Wendell Holmes. I love you, David, and I am so happy and proud for you. I can't wait to meet you two.